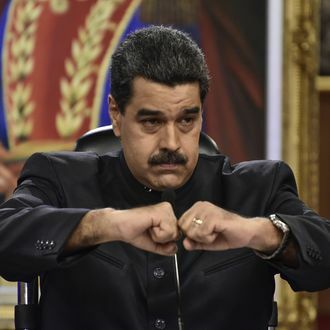 The United States has slapped Venezuelan president Nicolás Maduro with sanctions following Sunday’s contested and bloody elections to choose delegates to rewrite the country’s constitution. The United States targeted 13 current and former government officials with sanctions ahead of the weekend vote, and had threatened even harsher measures should Maduro move forward with the election, which many in the international community — the U.S. included — see as an attempt by the president to consolidate his power and push Venezuela toward an autocracy. According to Reuters, the U.S. is still mulling even tougher moves against Venezuela’s oil industry. Some critics say such actions will ravage what’s left of Venezuela’s struggling and oil-dependent economy, and would be most acutely felt by the wider population already suffering from food and inflation crises.